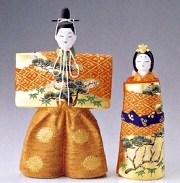 A pair of standing Hina dolls is called "Tachibina". Tachibina is one of the popular painting subjects in Japan. They hang Tachibina scrolls praying for children's healthy growth.